Power and influence in a community setting is often organised hierarchically, with political, educational, religious, or economic leaders at the top. The opinions of those at the top of the hierarchy shape a community’s support for your programme.1 Creating positive partnerships with the leaders at the top develops important inroads across a community. The failure to do so can mean political, economic, and logistical hurdles down the line. 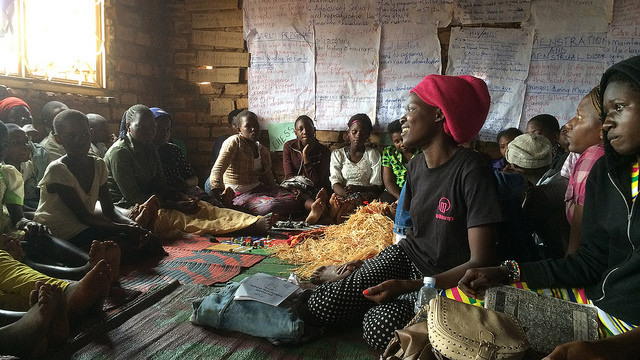 Engaging different community leaders may require a variety of approaches, depending on who they are and what their opinions are on girls in their community. For example, you would have to take a very different approach with a conservative male religious leader than with a woman community leader who is the head of the local women’s committee. The male religious or cultural leader is usually charged with upholding community cultural traditions and practices, which may be in conflict with girls participating in sport. In order to navigate this, it is important to understand these stakeholders and to engage them when planning and implementing your programme. On the other hand, a woman community leader who is the head of a women’s group may be a valuable ally in gaining support for your programme and may even be able to speak with other more conservative community leaders for you. Creating alliances and working relationships with these leaders may mean the survival of your programme. Being part of the planning of the programme means more knowledge and control over how it is implemented. The programme may complement an initiative for girls that they already support. Organise community meetings and ask the community leaders to lead them to talk about your programme and the benefits. Meet individually with community leaders to discuss the programme before you have events or new activities. Maintain constant communication and transparency. Listen to advice and concerns. Offer community leaders advisory positions on with your organisation. Be transparent about where your funds come from and how you spend them on the programme. Adhere to cultural and religious customs when appropriate. If you work in a Muslim community, dress appropriately for their culture, even if it is not yours, when visiting and speaking to community leaders. Ask for suggestions from community leaders when a problem arises. Host events in religious centres and ask permission from religious leaders, especially when searching for a venue. Don’t demand more time and energy than community leaders are able and willing to give. Respect the cultural landscape and try to work within it, as long as expectations of girls do not conflict with their human rights. Be patient and understand that trust is built over time. Solicit the help and expertise of community leaders. Consider asking them for referrals or for help linking you to people who they feel may help improve your programme. Once you contact the referral, remember to write or call back immediately and thank them. Show them how your programme helps strengthen the community that supports them. Aligning with a political party makes your programme susceptible to the rise and fall of that party. The well-being and development of girls is not a political issue, and constantly reiterate that your sport programme has no political agenda. Follow up with letters, conversations and tokens of appreciation, like t-shirts, photos from events, etc. Recognise supportive community leaders with an award. Be clear to the rest of the community about what you are rewarding and why. A Coaching For Hope programme working in conservative Muslim villages in Northern Burkina Faso has staff visit religious leaders with young women from neighbouring villages who themselves participate in sport. These young women explain that they wear the hijab when they play and that they have remained good Muslims while playing sport. Women WIn partner BRAC Uganda hosts Community Leaders Workshops in the different communities where they implement the Livelihood for Adolescence Program (ELA Program). The ELA program is designed specifically to improve the quality of the life of vulnerable adolescents by organizing them, creating spaces of their own and helping them develop a set of skills so that they can live and grow as confident, empowered and self reliant individuals contributing to change in their own families and communities. The Community Leaders Workshops are events where prominent female figures from the community visit an ELA club to talk to the girls about sexual health, life challenges or a host of other topics.The girls can ask questions and make valuable connects to important and prominent women and create a network of mentors and advisors. Caption: BRAC Uganda ELA club. F. A. Kuponiyi. (2008). Anthropologist, 10(4), page 239-243.